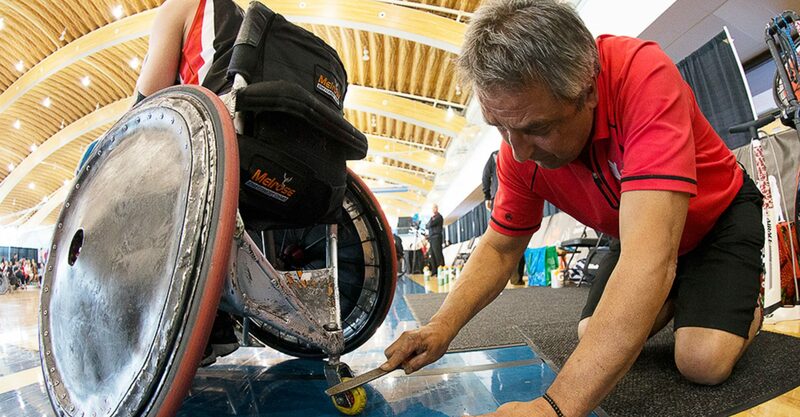 It is important to use the right equipment when you try a parasport to ensure you have a positive experience and get a good feel for the game. There are two types of wheelchair rugby chairs: offensive and defensive chairs. Offensive chairs are set up for speed and mobility and contain a front bumper to prevent other wheelchairs from hooking it. These chairs are used by players with more function. Defensive wheelchairs, like the one pictured on the left contain bumpers set up to hook and hold other players. These wheelchairs are most often used by players with less function. The game is played with a white ball identical in size and shape to a regulation volleyball. In addition to the ball, four cones, pylons, or other similar markers are required to mark the ends of the goal lines. A game clock and a 40-second score clock are also required; any clocks used for basketball, handball, or other similar sports will be sufficient. Played on a regulation hardwood basketball court that is marked by boundary lines, a center line, a centre circle and two key areas. The game is played with a standard volleyball. A team consists of up to 12 players. Teams are mixed; men and women can play on the same team. All players must have functional impairment in at least three limbs. To ensure fairness, all players have a classification (a measure of their functional physical ability), which ranges from 0.5 (least function) to 3.5 (most function). Players with different classifications play different roles on the court. Each team fields four players at one time. These players must add up to 8.0 classification points per team. The game consists of four eight-minute quarters. There is a two-minute break after the first and third quarters and a five-minute break at halftime. A goal is scored when a player carries the ball across the opposing team’s goal line. Two wheels of the player’s wheelchair must cross the line and the player must be in possession of the ball. Each team has four time-outs of 30 seconds each, which may be used during the four quarters of regulation play and may be called by players on the floor, and two one-minute bench time outs that can be called by the coach. If the score is tied, an overtime period of three minutes will be played. Additional overtime periods can be played until one team wins. Physical Advantage Violation: When a player who has possession of the ball touches the floor with any part of his body, or with any part of his wheelchair except the four wheels and anti-tip device. Ten Seconds – No Dribble: A player who has possession of the ball must dribble or pass every 10 seconds. Ten Seconds in the Key: A player whose team has control of the ball cannot remain in the opposing team’s key area for more than 10 seconds. Twelve Second Violation: After inbounding the ball, a team has 12 seconds to bring the ball over the half-court line. Charging Foul: Occurs if one player strikes another player with excessive speed or force, risking injury to the player. Contact Before the Whistle: Occurs in one player makes deliberate or advantageous contact with another player while the ball is dead. Each team will receive one contact warning in each half. Out-And-In: Occurs when a player who has possession of the ball leaves the court with one wheel on the goal line and then returns to the court without a second wheel crossing to score a goal. Four in the Key: Occurs when the defending team has four of their players in their own key area. The foul is charged to the last defending player who entered the key. Holding: When a player grasps or holds the wheelchair of another player with a hand or other part of the body. Illegal Use of Hands: When a player strikes another player using his arms. Spinning: When a player strikes another player’s wheelchair anywhere behind the axle of the rear wheel, causing the wheelchair to rotate horizontally or vertically so that the player’s safety is at risk. Technical fouls: Occurs when a player or coach acts in a disrespectful or unsportsmanlike manner.